There seems to be an issue with find usages not reliably finding all usages. I am using the latest EAP for phpstorm 6. I right click on the function (the scope is set to project) and it says there are no usages. Later on I am working on something else and find usages of the function that phpstorm said werent there. After further tinkering it seems as if (even though I have the scope set to project) it is only searching files that are open in a tab. If I open the tab, it finds the usages. If I close that tab, it can no longer find the usages. I have the scope set to search the whole project (find usages settings) but that doesnt appear to be what is actually happening. Has anyone else experienced this? Is there a work around? I am using search for php. Didnt realize another had been released until today. Yes, 124.509. I didn't realize another version was released either - wonder why I did not get the email. Oh wait, I only see a Webstorm update, not a PHPStorm update. Ah, I guess it was released last Wednesday and I didn't notice. I tested in the newer one and I don't seem to have the issue. So it is either fixed or there were some circumstances that are no longer present (I'm using a machine at work instead of at home now). 124.373 and the newer one at work is now 124.509. I'm sorry, does it work in the end? I've found the same thing. I can't get Find Usages to work at all. I'm working on an existing PHP project. Whatever I try it just says No usages found. I'm using the current version - downloaded yesterday. OK, log file is welcome. 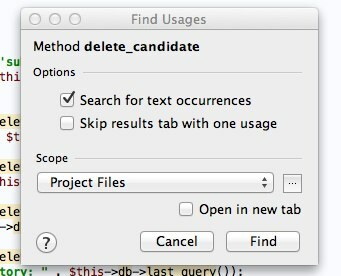 And a screenshot of the search dialog as well. Where do I find idea.log? There isn't a Reveal log menu item under Help. The only log reference I can find anywhere is the event log - which doesn't generate anything when I run Find Usages. Probably just replace josh with your username. Is there a /home directory? It might be in a simliar location: /home/username/.webide60 or something similar. Thanks, log looks good. Does the problem reproduce on a small sample project? 1) See if File | Invalidate Caches will help. 2) Does PhpStorm complains about the method (or whatever you are searching for) in any way (when you using it, not when declaring) -- I mean, any warnings (like "Unknown method" etc)? Can you show a screenshot of such call? I tried that but the result was the same. No error messages of any sort.